The primary series of Ashtanga Yoga is called Yoga Chikitsa, which means Yoga therapy. The entire practice is put together to cleanse and purify the body on many different levels. The practice of postures works primarily on keeping the body healthy; if the body is diseased we must put our energy into healing the body instead of our spiritual development. 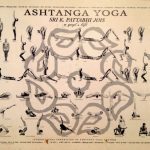 Ashtanga Yoga is a scientific approach developed to cleanse and purify the body in a systematic manner. (Each series unlocks a particular aspect of the body and mind. The primary series called yoga chikitsa (yoga therapy) realigns and detoxifies the physical body, particularly the spine. It also builds a foundation of considerable physical strength, especially important to balance out the overly flexible students who are often drawn to hatha yoga practice. The intermediate series, nadi shodana (cleansing of the nadis or river or channels), purifies and strengthens the nervous system and the subtle energy channels that link the seven chakras. The four advanced series (originally taught as two series, but subdivided to make them more accessible) are collectively known as sthira bhaga (divine stability). These sequences take to new heights the strength, flexibility, concentration, and energy flow cultivated in the first two series.